Please be patient while this post loads . . . picture overload! Are you ready for some lip-smacking deliciousness? Over the years, I’ve tried many Italian Florentine Cookie recipes. Most of them have very similar ingredients, but today I found one with Toasted Coconut & Oatmeal. In my mind, that was a tad bit unusual but since I love both, I figured I’d give it a try. Geez . . . I’m sure glad I did. These desserts were rated 5 star, by my “not really a dessert lover” husband! I’m excited to share this post, because these cookies keep very well for several days, and there are so many beautiful ways to use these delicate lace like cookies. or . . . You can simply eat them as a cookie! You could also just drizzle sweet chocolate on a single Florentine. Come on . . . Get into your kitchen and we’ll make them together! 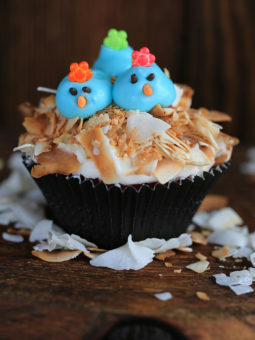 You will need: Butter, Oatmeal, Sugar, Flour, Light corn syrup, Cream, Vanilla, Sliced Almonds, Toasted Coconut. You don’t even need an electric mixer . . . Just a large bowl & a wooden spoon! Important Note: Make sure that you either use parchment paper, or a silpat on your large cookie sheets. DO NOT put more than 12 cookies per sheet. You can only use 1 Teaspoon . . . I’m serious! They will spread. 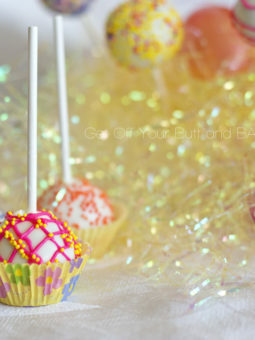 Use the back of a spoon or your fingers to flatten the little balls. Moisten your spoon or fingers just slightly, and then it won’t stick! Bake in a preheated 375 degree oven (1 cookie sheet at a time) for about 6 minutes. Watch very closely, as they don’t take long to cook. You want them to be a nice golden brown color. Let them cool just a bit, and then remove the cookies to parchment paper to cool. I wanted to also show you that you can use Cream Horn Molds, and quickly shape the WARM florentine around it. If you want to make several of these, then you’ll want to make your cookies slightly bigger, so that it covers the length of your mold. *I just wanted to show you your options! You can find these molds at nice Cookware stores or online. 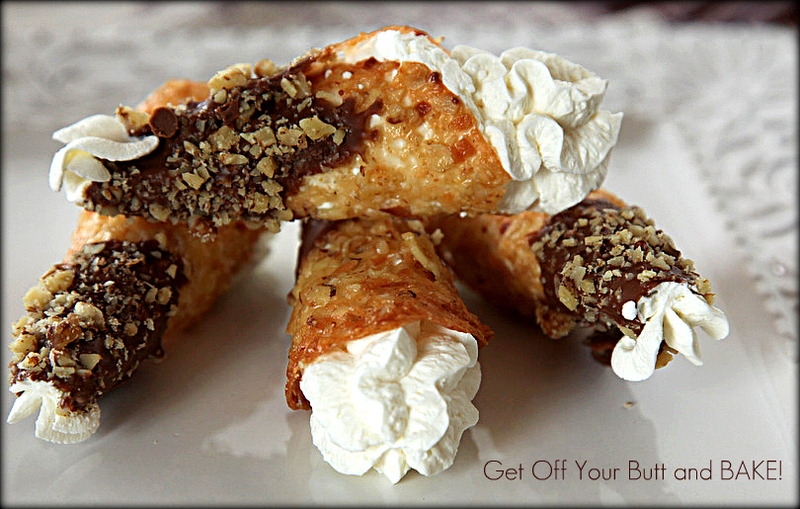 Just look at these very delicate Florentine cookies or Cannoli horns . . . Handle them with care! Now that you have all your cookies done, it’s time to Melt some Chocolate. 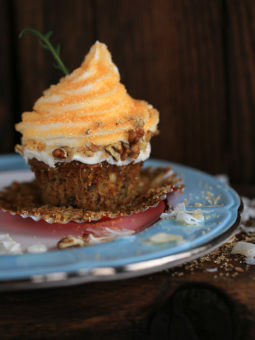 This is optional of course, but it sure does make them extra delicious! Note: I simply melted 2 large size Symphony Bars. Dark Chocolate or White Chocolate or both would also be scrumptious. Before I melt the chocolate, I add 1 tablespoon of Crisco shortening. This is optional of course, but it puts a very nice gloss in the chocolate, and it stays smooth and doesn’t seize up quickly. You can work with it much longer. Use your favorite chocolate. Now take another cookie . . . and give it a top. You can also decorate the Florentine Horns or Cannoli’s, by dipping the ends of each horn in the melted Chocolate. 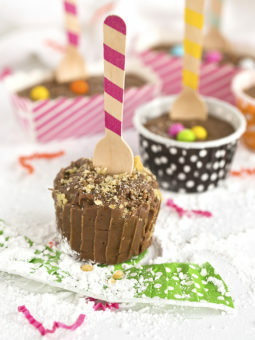 Sprinkle chopped Almonds, Walnuts or Hazelnuts over the chocolate. Set on Parchment paper to setup. Just place them on some Parchment paper, and set the cookie sheet in a cool room, so that the chocolate can set up. My garage is cold, and it only took seconds! To store these cookies, I just left them on Cookie Sheets, and simply placed the wax paper over the top. When you are ready to make beautiful desserts, you can Whip up some Vanilla Bean or Almond flavored Whipped Cream. If you prefer, you could make Italian Swiss Buttercream or fill the Cannoli’s with Bavarian Cream, and grab some raspberries, strawberries, blueberries, etc. to garnish with. I put the Whipped Cream in a Pastry Bag, and used a Closed Star Tip to make it even prettier. Hint: Use Powdered Sugar instead of White Sugar to sweeten the Whipping cream. It will hold it’s shape much longer. CAUTION: Extreme deliciousness! 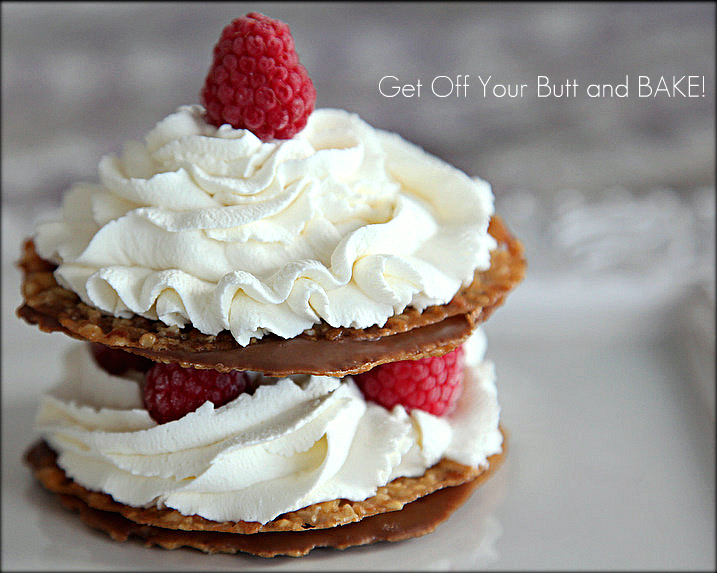 You’ll feel like your eating a spectacular dessert in a fancy Restaurant! In a glass bowl, melt butter then add the Oatmeal, sugar, flour, cream and vanilla. Stir well then add the corn syrup. Stir in the Sliced Almonds & Toasted Coconut just until mixed. Line your pans with parchment paper or silpats. Drop mix using only 1 Teaspoon of dough. On a large Cookie sheet, do place more than 12 little cookies. They will spread out thin, so you need at least 2 to 2 1/2 inches between each drop of dough. Spread with spatula, the back of a spoon, or the tips of moistened fingers. Try to keep a round shape. Bake for 6 minutes in a pre-heated 375 degree oven, or until golden. Watch them carefully…..they burn easily! Only cook on sheet pan at a time. Now . . . Melt your chocolate. I used Symphony Chocolate Bars. Break up the chocolate in small pieces. This next part is optional, but it truly helps: Add 1 Tablespoon of Crisco Oil to the chocolate. Place your bowl of Chocolate in the microwave, and check it every 25 seconds . . . stirring after each segment, until the chocolate is melted. Don’t let it get too warm, or you’ll ruin it. Take it from the microwave, just before the last small piece of chocolate has melted all the way. Just continue stirring until that small piece is melted. Take a small spatula and spread chocolate onto the smooth side of one cookie. Now sandwich another cookie on the top. Place the cookies on parchment paper lined baking trays. Put them in the fridge or place in a cool room so that the chocolate can set up. A cold Garage works in seconds. Enjoy! Store these on Cookie sheets with waxed paper in between each layer. Top with another layer of wax paper. They will keep for days. Whip Cream to sandwich in between Florentines. Add Raspberries, Strawberries, Blueberries, etc . . . to garnish. Fill Cream Horns with Whipped Cream, Bavarian Cream etc. They are so beautiful! What a gorgeous treat. Florentines are sooooo delicious. How gorgeous! These look asbolutely delightful…very beautiful presentation! I am definately saving this! Your site is so lovely! Your photos are gorgeous, your recipe sounds amazing! I am a big fan of oatmeal and coconut myself. I can’t wait to try making these, thanks! I used instant, but I believe the Old-fashioned would also work just as well. 1/4 cup + 1 tablespoon cream is added to the dough. 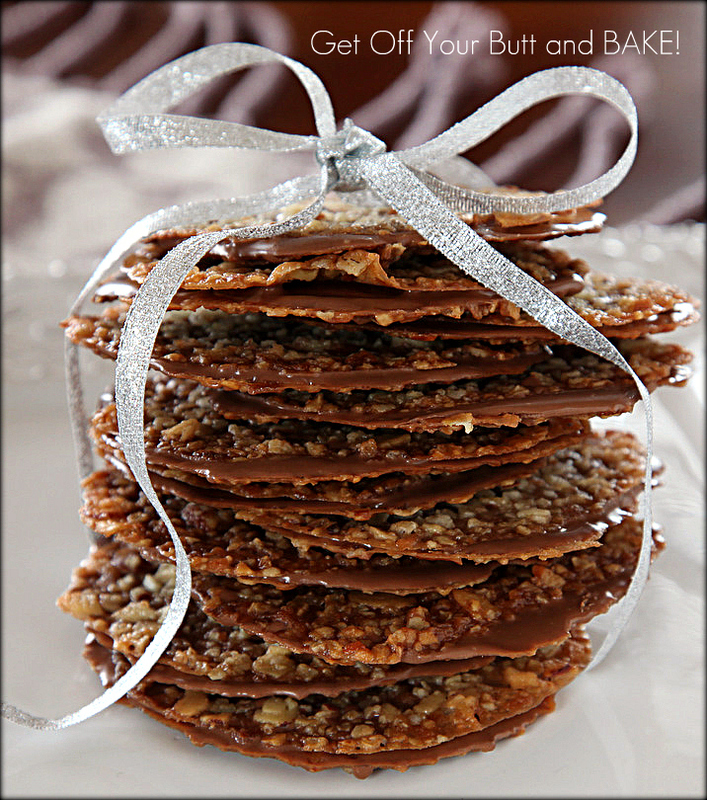 Double checking, cause I wanted to make these today for a cookie exchange party…they look delicious!!! Yes…you will need at least 1/4 cup of cream for the florentines and possibly that extra tablespoon. You will whip extra cream, sweetened with sugar to fill the cookies and horns. dough or not? Reading the two comments above mine. You told Rachael that her problem was adding the cream to the cookie dough. Then you told Nicole that she needed to add the cream to the cookie mixture. Could you please clarify this for me? I’m so sorry for the confusion. Yes, the recipe calls for adding 1/4 cup + 1 tablespoon cream to the florentine dough. It also calls for 2/3 cup butter. The dough will spread out drastically while baking making them very thin! . . . paper thin! Any other cream used is just whipped & sweetened to use between the cookie layers. You say cream. Is there a certain kind? Is heavy cream the same as whipping cream? I always get confused with this.